Man, this weather has been brutal. I don’t get snow days in my line of work and when the weather’s bad, it usually means I’m on the road more. Last Friday was one of those days. I met my co-worker at the Gun Lake Casino exit on US-131. We had planned to stay in Allegan County all day but plans change and we ended up back in Kalamazoo with his car still at the park and ride near Wayland. That means, after work, I had to drive him back to his car before going home. Friday night is typically pizza night in our house. J had ordered Dominos for herself and the kids. I don’t usually mind Dominos but I really don’t love their thin crust. The kids like it though so that’s what J gets. I figured since I was going to have cold pizza and it was one I didn’t really like, I might as well just bring one home for myself. I noticed a new business on those blue highway signs near the exits as we were heading north on US-131 near D Avenue. I caught just enough of it to see that it said pizza. I did some Googling once we got to the park and ride and found what I was looking for. 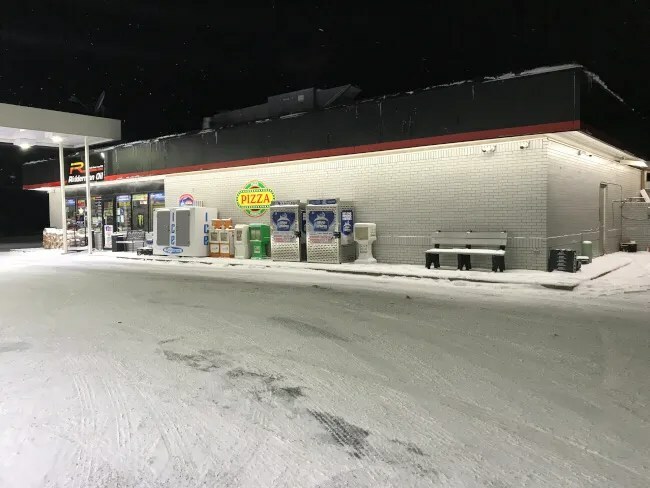 Pizza Perfect is inside the BP gas station on D Avenue just east of the US-131 exit ramp. The small space used to be a BBQ place called Smoke ‘n Buns. They went out of that location quite a while ago and it appears this pizza place has been around since last summer. I called my order in while I was sitting in Wayland so I assumed I’d just pick it up in the back of the store where the BBQ used to be. That entire area is closed in now so I was thrown for a loop. It’s not a separate counter pick up anymore. I noticed a pizza display case near the cash register. They have pizza available for pizza by the slice right at check out. I also noticed a box sitting on top to keep it warm. I assumed that was mine so I grabbed a couple of Pepsi’s and headed to check out. The cost of the pizza was about $14 and paid alongside everything else at the gas station registers. I grabbed my pizza, which felt really heavy, then headed home for a later dinner with the family. The pizza box was heavy. This was no light, airy pizza. It was a brick. The dough is hand tossed which gives it an uneveness. The cheese and toppings…which on my pizza were pepperoni and bacon…and piled on adding to the weight of each slice. The dough is pretty chewy. It’s a very dense bready dough. 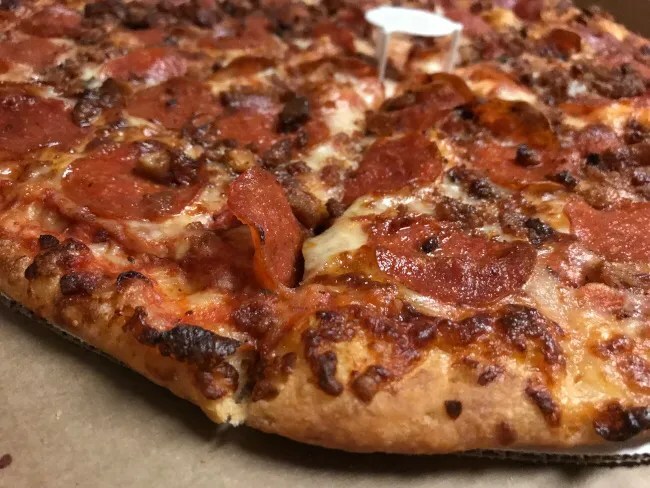 It doesn’t add a lot of flavor to the pizza but it’s really hearty and holds up to the menagerie of toppings on top of it. The pizza had a really great golden brown color throughout and even a little bit of a crisp on the bottom, but the middle of the crust stayed pretty soft. 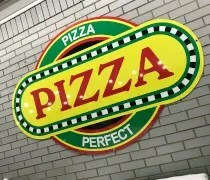 Pizza Perfect is a good option for pizza in an area where there isn’t anything else close. 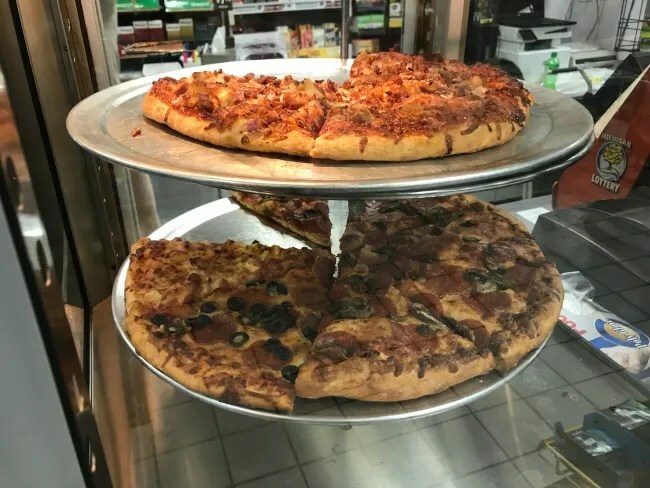 It’s better than typical gas station pizza an on par with typical carry-out/delivery places. 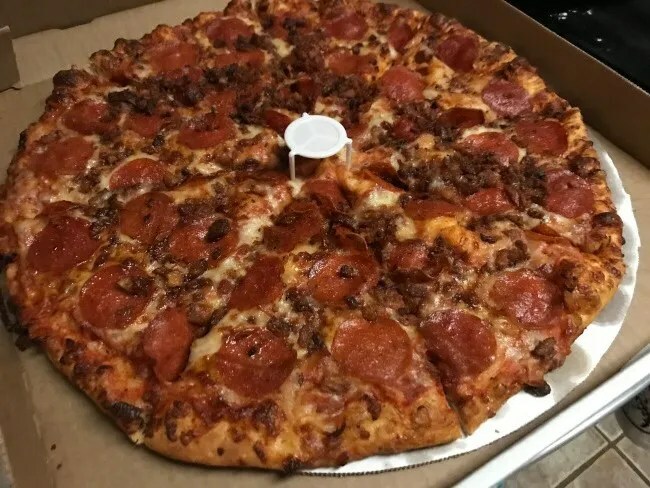 I got two solid meals out of this pizza and with all that meat on top, my family wouldn’t touch it…leaving all those crispy bacon bits and pepperoni’s all for me.